Shakespeare’s essay on political expediency and the fragility of power is notoriously difficult to stage effectively. With an early exit for its eponymous lead, and the closing scenes largely taken up by folk shouting and pointing at hills, it’s a play that requires imagination and flair. Fortunately Nicholas Hytner proved more than equal to the task. 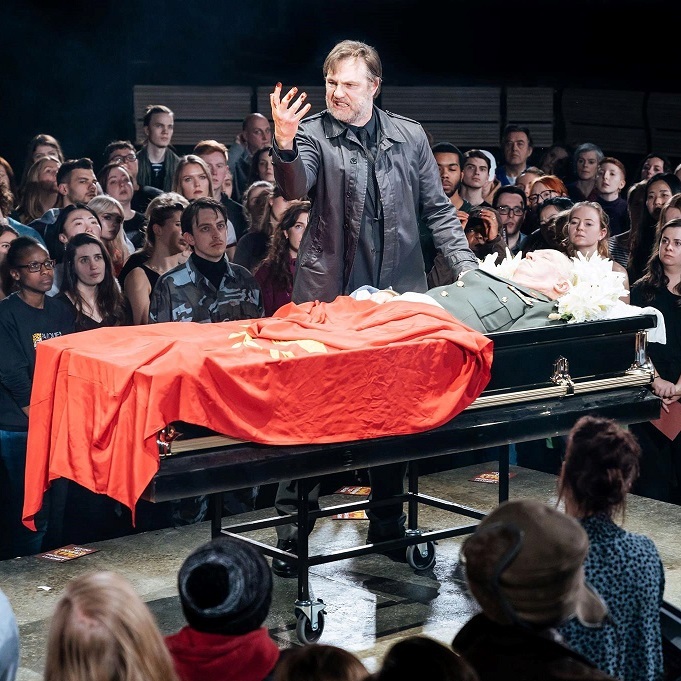 This promenade production set the play in modern dress, cleverly casting the audience as the mob, seduced by David Calder’s populist Caesar, who seem content to be fed blistering rock music and easy promises. Surrounded by lackeys and acolytes from the outset, Calder emerges as a crowd pleaser rather than a fascist, so that the excellent Ben Whishaw’s Brutus appears bookish and irrelevant. Despite knowing what’s coming, Hytner thereby injects tension and suspense into the play, as the conspiracy takes shape, and is then enacted with a brutal ferocity. After which, the play becomes all about Mark Anthony, and David Morrissey’s grandstanding take on him. There is still a lot of shouting and pointing, but set in the bunkers and trenches of war, its presented with a visceral intensity that carries the drama along. On screen, this works well. For those lucky few at the performance, it must have been amazing.